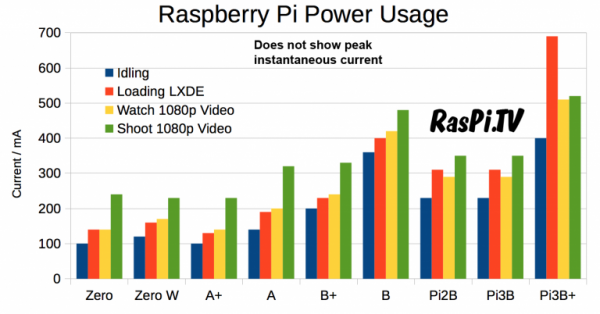 How Much Power Does Raspberry Pi 3B+ Use? @Raspberry_Pi #PiDay #RaspberryPi « Adafruit Industries – Makers, hackers, artists, designers and engineers! The main reason I do this is that, if you are running a Pi on batteries, you need to be able to know how long it will run for. So I don’t go in for complicated benchmarking tests (although arguably perhaps I should, now that the CPUs are getting more powerful and hungrier) but a straightforward batch of tests that I’ve always used. It gives you an idea and enables you to work out your power budget. 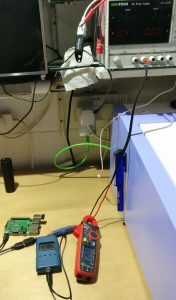 With just an HDMI screen and a USB keyboard/mouse dongle connected, the Pi is powered using my bench power supply at 5.2V (supply current limit = 3 Amps) wired, via the eMeter’s calibrated 20 Amp shunt, to the uUSB power input on the Pi. Current and voltage are measured using my eMeter (also used my clamp meter to confirm this time) and calibrated shunt whilst performing four different activities. “Shooting video” is done without saving the video output to the SD card. Watching video is done with a 1080p video on the SD card. The rest is self-explanatory. The camera module is unplugged for all but the shooting video test. The Pi3B+ was connected to wifi, but no bluetooth devices were in use.